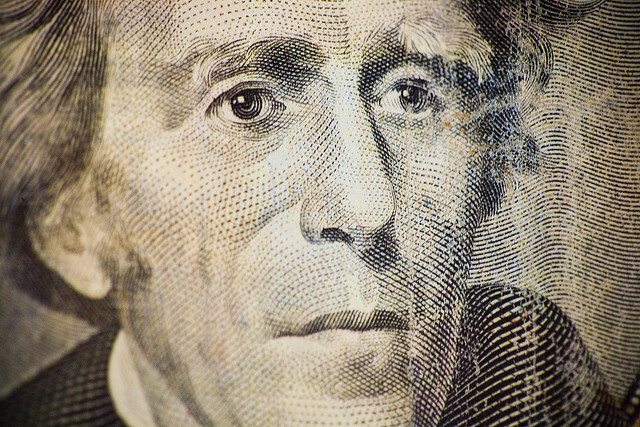 Here’s the smart way to figure out what you’re worth: get your hands on some cold, hard data. I’m going to lay out the steps that will help anyone get a solid idea of what their value truly is. I would recommend running through this exercise once every couple of years, especially if your responsibilities have changed or if you start to feel underappreciated. You might find out that you’re actually getting paid quite fairly, and while that may not seem like great news (because we want more! )—it’s actually a good thing. It might get you to fall back in love with your job, which means you don’t have to go anywhere or change anything. The first thing we want to do is find out what other people are making in similar roles and industries. It’s easy to get general data on your title, but you want to get as close to what you do as possible to make sure you’ve got accurate data. Having some objective salary numbers from four different places will give you a decent idea of where you should be. You’re going to go to each one of those sites and enter your title and your zip code to get some salary info. Most of these sites rely on survey data, and that’s good enough for now. The point is to gather lots of data points from independent sources to make our case. Eventually, we want to have the confidence to point to these numbers and say: this is about how much I should be getting paid. Payscale.com is going to ask you a bunch of other stuff, but don’t worry about it: you don’t have to fill it all out, most of it is optional. So for this copywriter in Chicago, we could reasonably assume he/she should be getting paid between 40k-90k with an average around 60k. Yes, that’s a wide range, but that’s good. We want a wide range because it’s easier to make the case for a higher number if we have a higher range. Want to make the case for why this person should make 120k? Good luck. You can point to that one source that listed 118k as the high range, but when you’re only using one source your argument loses a lot of power. You could very easily counter that argument, but because we’re trying to make this as painless as possible for everyone involved, let’s do something else. In order to cover yourself for this counter-argument, there’s only one thing you can do: find an actual job opportunity that’s real and has a salary tied to it. So for that you need to hit up the job boards to find actual job listings. Sometimes recruiters will post a job for a company and they’ll post the salary range when the company’s post doesn’t. How do you find the recruiter’s post? By putting it in quotes, Google will return an exact match to the that specific sentence. So if a recruiter has posted that job anywhere else (and they typically use the same exact language with some additional details) and you might find a salary range that way. Glassdoor is great too because you can get specific job titles tied to companies and get pretty close to a “real” salary that way. And check out Indeed.com, they have a salary filter on their site that can also help. What we’re also doing here is adding two elements to any potential negotiation we may have down the road with our current employer: a touch of reality and a sense of urgency. By doing the extra work and bringing in a real position with a real salary tied to it, our argument becomes stronger. Instead of relying on surveys and what others say they’re making, you’re taking information from the market itself to figure out what they’d actually pay someone like you. It basically gives them a very soft ultimatum: be fair or else. And fair is really all we’re asking for. 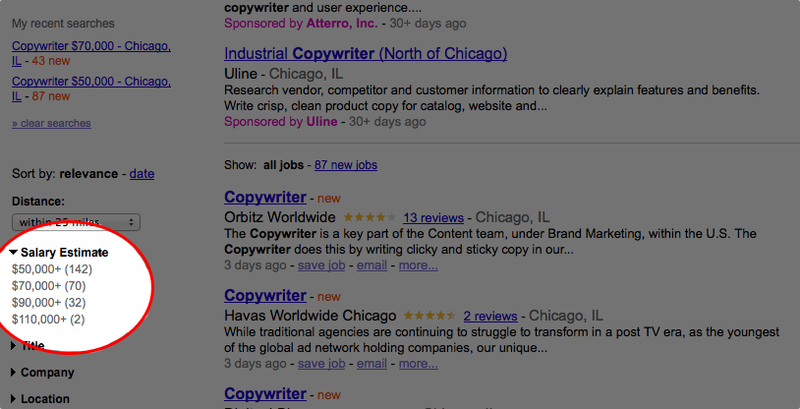 SIMULATION: I found a role for a Senior Copywriter role that says “up to $80k DOE” and another for a Copywriter at $60k. Both of these were posted by a recruiter working on behalf of a client. I saw several other “Senior” roles at a higher salary, which is great information to have for our fictional copywriter’s career. If you want to really go deep and get as much data as possible, it doesn’t hurt to reach out to a recruiter. If you’ve worked with one in the past, shoot them an email and ask what kinds of ranges they’re seeing for roles like yours and your experience level. You may have to remind them about your skills and history since they talk to a lot of people. If you’ve never worked with a recruiter, why not? It’s a great way to have someone else keep you in mind as they scour the universe of available jobs. Sure enough, it was a great fit and I ended up getting the job. Boom: it can happen just like that if you’re on their roster of potential hires. Google can help you find recruiters that are relevant to your role. Some recruiters focus on creative jobs like copywriting and graphic design, while others work in the technology space. Find a couple of relevant ones and get them an updated resume. When you meet with them, treat it like an interview: you want to make sure they get a solid impression of you so they’ll consider you as they find relevant roles. You can also go to LinkedIn and see if you have any connections with any recruiters or people that work in HR. They can’t share specific salary information about the roles they’re filling, but might be able to give you some feedback on the ranges you got from your online research and see if they’re on the high side or not. This should get you a wider net of real salary ranges for roles like yours. Who knows, you may even find a job you really like. SIMULATION: Your recruiter says he/she has gigs in the $60k range but every so often there’s one in the $70k range for copywriters that have specific SEO experience. Hmmm…interesting. They may not be in the same industry you’re in, and they may have a very different job than you do (and they might know you a little too well! ), but they might have some knowledge about what kind of money is out there. If you had a good relationship with an old boss, that might be another place to get some feedback. I know most people don’t like talking about how much they make, but if you no longer work with them, what difference does it make? And besides, they already knew your salary before so it can’t hurt. Some HR departments are really into this kind of stuff. They’ll spend a lot of time and effort to stay up to date with the market. Every time they hire a new person, they’re taking the pulse of the market and what those salaries are. Which is great—they’re trying to be fair and do the work for you (it is their job, after all). But in my experience it’s pretty rare, and most of the time you have to do the work yourself. Don’t worry: it’s fairly easy if you just set aside the time to do it. SIMULATION: Your friends and contacts in the know claim that they’re seeing salaries for Copywriters in the $60-70k range, which is higher than what you’re seeing elsewhere, but could just be the specific companies your friends are working at. You’ve got the information from the different salary sites, you’ve found one or two real jobs with a salary number or range tied to them, and you’ve gotten some additional numbers from recruiters and friends that helped guide you towards certain parts of the ranges you’ve found. Time to crunch the data. 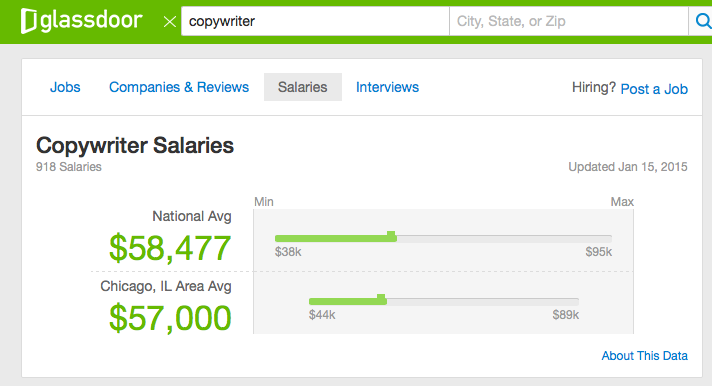 To me, it sounds like $55-65k is a realistic range for a Copywriter with some experience. But how much is our Copywriter currently making? Let’s say he/she’s making just $45k, which he was offered straight out of college four years ago and hasn’t seen any significant raises since then. At the time, he was happy to just get a job and start his career, but after going through the numbers it’s clear he is being underpaid. I’ve done this before and the reactions can vary, but a good manager will take the information to review it on their own time. They may even show it to the HR department and get to the bottom of why your salary doesn’t match up with what you’ve found. If he/she was making $65k, then the end result of all this research is twofold. For one, he’s being paid fairly, which is a good thing! Knowing you’re being paid well is a great thing because it’s impossible to be happy if you’re not being paid fairly. But wait: don’t we want to find a way to make more money? Of course, we all do. But for now it’s good news—you aren’t underpaid. Second, we’ll work on figuring out ways to add more value so we can start looking at some of the higher ranges in the research ($70-$118k). If someone is getting paid at that level, we want to get ourselves into that top tier.